Obesity has become the most common chronic disease of the present day, with significant increases in prevalence in populations across the world and all age groups. This has resulted in a dramatic increase in obesity-related metabolic and cardiovascular complications, making it an important public health issue. Type 2 diabetes associated with obesity or 'diabesity' is today the most common form of type 2 diabetes. It is also associated with a number of other cardiovascular risk factors, which constitute the metabolic syndrome. Effective management of 'diabesity' is crucial to the reduction of morbidity and premature mortality due to cardiovascular disease. 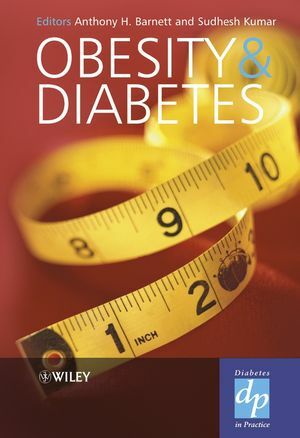 This book comprises chapters written by leading international experts on various aspects of obesity-related diabetes. As a practical reference guide, it is suitable for all professionals with an interest in this field. Emerging problems such as childhood 'diabesity' and the impact of obesity on polycystic ovary syndrome will be of interest not only to paediatricians and endocrinologists, but also to general practitioners and other healthcare professionals. The contemporary approach to the clinical assessment of obesity and its management in both primary and secondary care settings is also described. Professor AH Barnett, MD, FRCP, Department of Medicine, Birmingham Heartlands Hospital, Birmingham, AL. Dr S Kumar, MD, FRCP, Professor of Medicine (Diabetes & Metabolism), Warwick Medical School, University of Warwick, Canada. 1. Changing Epidemiology of Obesity - Implications for Diabetes (Jonathan Webber). 2. The Genetics of Human Obesity (Victor J. Lawrence and Tahseen Choudhury). 3. Lifestyle Determinants of Obesity (Susan A. Jebb and Jeremy Krebs). 4. Pathogenesis of Obesity-Related Type 2 Diabetes (Phillip McTernan and Sudhesh Kumar). 6. Diet and Food-based Therapies for Obesity in Diabetic Patients (Iain Broom). 7. Behavioural Modification in the Treatment of Obesity (Brent Van Dorsten). 8. Physical Activity, Obesity and Type 2 Diabetes (Carlton B. Cooke and Paul J. Gately). 9. Diabetes, Obesity and Cardiovascular Disease – Therapeutic Implications (Jayadave Shakher and Anthony H. Barnett). 10. Drug Therapy for the Obese Diabetic Patient (John P. H. Wilding). 11. The Role of Bariatric Surgery in the Management of Type 2 Diabetes (David D. Kerrigan, James Evans and John Pinkney). 12. Childhood Obesity and Type 2 Diabetes (Krystyna A. Matyka and Timothy Barrett). 13. Obesity and Polycystic Ovary Syndrome (Diana Raskauskiene and Richard N. Clayton). 14. Management of Diabesity in Primary Care: a Multidisciplinary Approach (Ian W. Campbell).